Oh Dairy Queen! Once again your whacky delivery schedule has created a DQ that doesn't have the necessary components for the latest blizzard of the month. It's only the second day of the month, so I can't say I'm totally shocked especially since this particular DQ and another have always had trouble keeping up with the times. Oh well. The good news is I have something else for you. About a month ago, grubgrade mentioned that new limited edition Royal Shakes were coming to DQ. It's time to check them out. Before you stands a (blurry) Oreo shake. If you squint you can see the tiny oreo bits everywhere. What? It's not like I was going to try the mint chip or caramel cheesecake one first. I don't know if this close up helps, but hopefully you can see a wonderful assortment of various sized Oreo bits. Actually, I take that "wonderful" back since I'm not a huge fan of the pieces that are big enough to jam my straw. Hold on, let's step back. I like this shake, I really do. It's no super premium cold stone or B&J shake, but the Oreo flavoring is right up there. It's not just a shake, I'm sucking down real oreo bits. 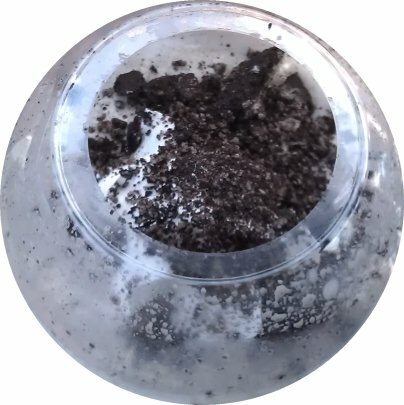 This isn't a cookies n' cream shake so much as it is dry, fresh oreo bits mixed with a shake. Grrr, I'm talking in circles. The point is that it's more potent (and albiet a little drier) than a typical shake. I liked it, I liked it alot. It's a fun change from the norm. Going back to the jammed straw comment, that's really my only compliant. This isn't exactly the easiest shake to drink while driving home after a movie. I totally enjoyed it though and I think if you blended it to much then you would lose that strong Oreo vibe. I only got a small but I could have easily polished off a larger one. It's all about the Oreo flavor for me and this has plenty. I couldn't resist and I finally gave in to all those signs for the Sweet Apple BBQ Burger. 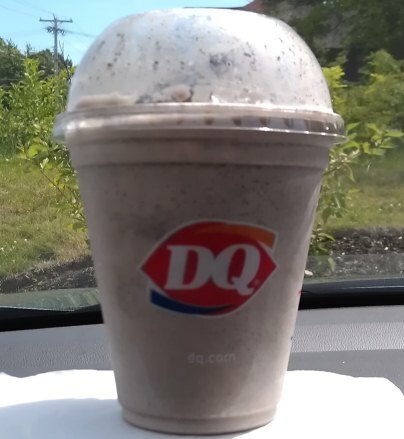 Seems every DQ grill n' chill is advertising them so who am I do disappoint their begging and pleading. I mean, it's only $2.99. 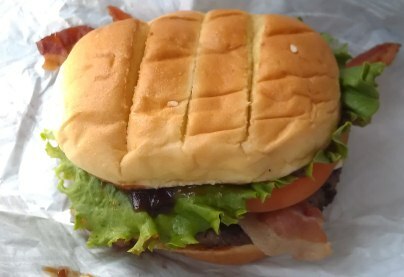 While grubgrade enjoyed this burger, I will admit I was unimpressed. I don't seem to have the culinary skills to pick up on any apple flavoring, the bbq made my tongue tingle (thank goodness for the shake), and the beef was grey and meaningless. I won't say it was terrible, and it got me some needed protein, but I wouldn't go out of my way for it. My apologies for your problems. I would definitely contact DQ and let them know. I'm not sure what went wrong, but my shakes have always been well made (maybe the soft serve machine was on the fritz or something).